We have completed the initial designs of the 17,000 SQFT new Ministry Center. Our next step is to review some initial cost estimates and perform some value engineering as needed to conform to our project budget of $6.3 million. 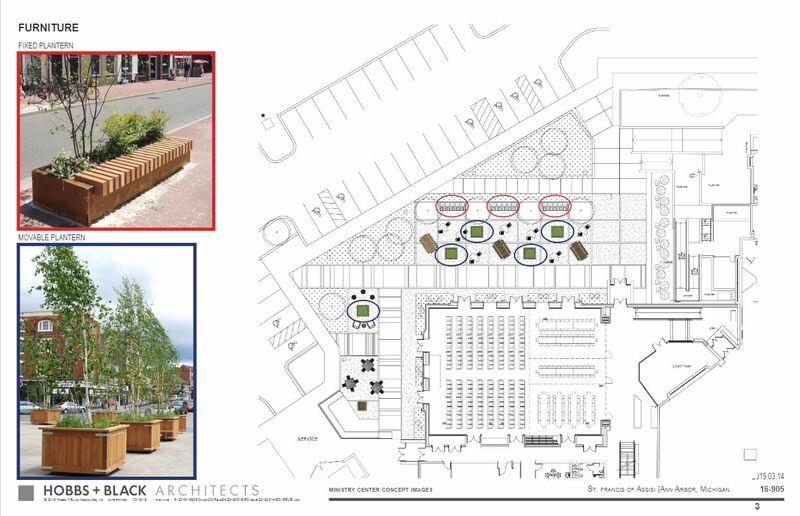 Once we know the costs are in line with our budget, the Architect and Building Committee will work through the summer to complete the Design Development by September 30, 2019. We are still looking to begin construction as early as mid to late 2020 with completion by Easter 2022. Thank you to all who attended our Town Hall events. 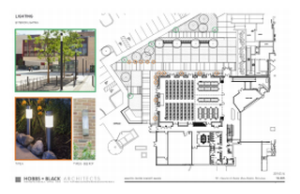 You can still provide feedback on the building design by contacting ministrycenter@stfrancisa2.org. One key feature of the Ministry Center is the use of exterior space for larger events during the warmer months. Events such as the church picnic or ice cream social, could be held outdoors without having to convert parking for event space. 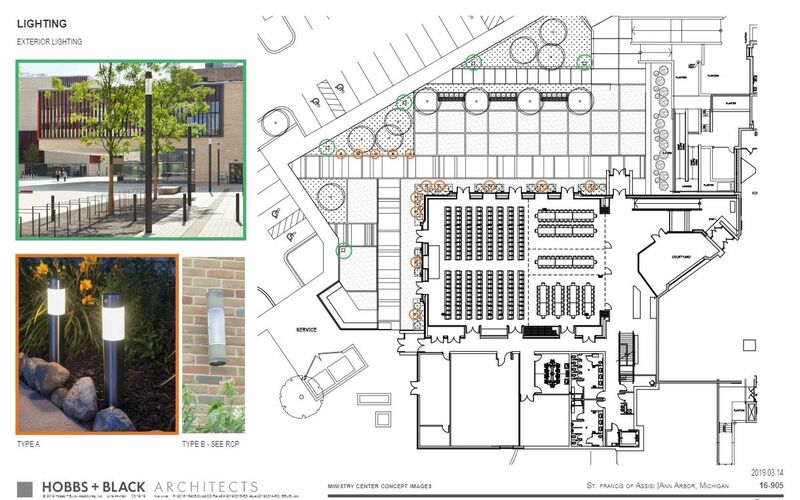 The patio and the Ministry Center main hall would be open to each other increasing the event space from 5,800 SQFT to 14,000 SQFT of total event space. The main hall can be open to the pre-function space (Lobby) to increase the size of the main hall to cater a large 300 top sit-down dinner with stage. 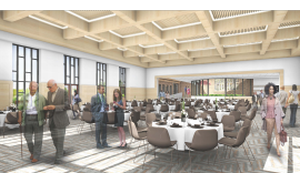 The main hall will be able to divide into four separate rooms based on the needs of the various functions. There will be counters and cabinets available for buffet style serving as well as to store dishes for event use. There will be a small area for coffee and donuts or any other pre-function needs. The idea of this space, other than to provide spill over for larger events, is an opportunity for parishioners to socialize without worry of having to move to accommodate the next event. Over 1,800 sq. ft. area which could accommodate a pre-function. Indoor access to the main church via current church west doors. 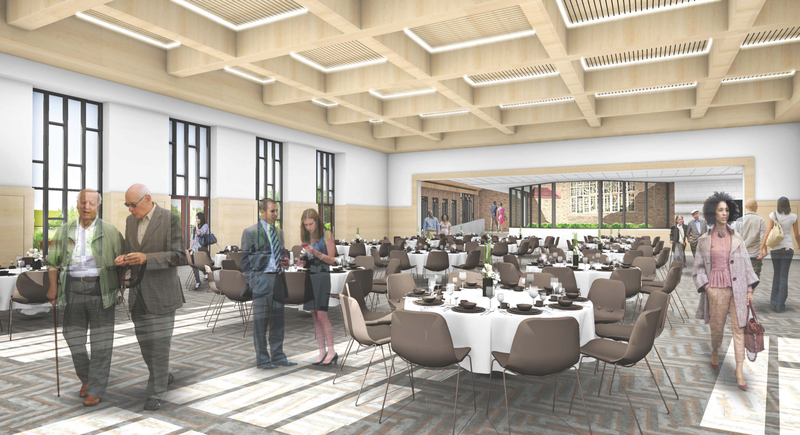 The new Ministry Center will have a total of 8 meeting rooms ranging in size from 5 to 150 guests, and include the main hall, multipurpose room, and parish office. This will help with any needs for conferences in the future. Handicap access from the west lot and from Frieze Ave.
Natural gas generator to serve the hall in times of power outages. 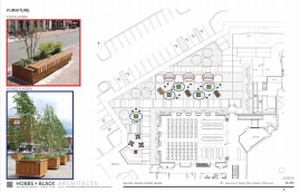 Large patio area to host outdoor events during the warmer months. Water detention system which would safety store water long enough for it to drain into the ground and away from our sewers. Additional access to East Stadium Blvd. from the west parking lot. Since our Parish Activity Center opened in 1980, we quickly outgrew the space within the decade. During the 1990’s, to help our growing school, the parish invested into the school by adding the library, science lab and additional classrooms. At the same time, we added the beautiful pipe organ in the church completing the original vision for the church in 1967. As we moved into the new millennium, our parish embarked on expanding the church by creating the family gathering space and baptismal font. Upon completion in 2002, Fr. Jim McDougall (previous pastor) knew that we finally needed to do something about the lack of space in the PAC. By this time, we had added storage around the walls losing approximately 500 sq. ft. of floor space confounding the issue further. Before the plan would be put into action, the parish (and later our entire nation) experienced a sudden drop in financial support. Any ideas of building a new hall during the financial crises were shelved until our parish and country were well healed. Fast forward to 2015 and 2016, those ideas were dusted off under the leadership of our current pastor, Fr. 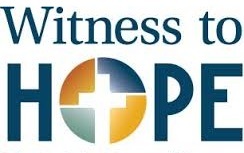 James Conlon, and are now getting implemented through Witness To Hope (WTH) – a combined capital campaign with the Diocese of Lansing. Now is the time to invest into our St. Francis faith community by embarking on a once in a generation improvement to our Parish. We have outgrown the PAC and must alleviate this bottleneck to better serve our various ministries, school, volunteers and community. Simply put, more meeting spaces will allow our community of faith to better serve God and help those in need both financial and spiritually. St Francis of Assisi Parish is a very generous community of faith. We have received over $7 million in campaign pledges so far. Of which, $1.7 million goes to the Diocese of Lansing, as our parish portion of the WTH combined campaign. Thank you to all who have given so far during the Witness to Hope Campaign. For all of those who haven’t given or would like to contribute more, we are about $1 million short of the combined $8.0 million goal. It’s not too late to give. Donations to the new Ministry Center are still being accepted. I’m pleased to announce that St. Francis Parish received $531,321.11 for the period October 1, 2018 – December 31, 2018 as part of our quarterly (reimbursement) payment schedule from the Witness to Hope campaign. This was not new pledges, but money on pledges made during the last three months of 2018. This money has been set aside in a high interest rate savings account until we are ready to use it for the construction of our new Ministry Center. During the third quarter of 2018, we fulfilled our parish obligation to the Diocesan portion of the Witness to Hope combined campaign. Going forward, 100% of all pledge payments made to Witness to Hope will be deposited directly to St Francis of Assisi Parish (account). Thank you to all who have made pledges! You may visit the Diocese of Lansing website at WITNESS TO HOPE. Under “Parish Affiliation,” please remember to select “St. Francis of Assisi – Ann Arbor” from the dropdown menu. You can use your credit card, or direct debit from your checking account. If your company participates in a matching gifts program, just click the “My Company Will Match My Gift” box at the end of the form. After completing your form, click on the “Donate Now” button at the end of the form, and you’re done. The two-level, 17,000 sq. ft. Ministry Center will be beautifully situated on the west side of the Church, continuing the same architectural look of the current Church. 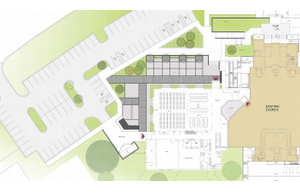 The Ministry Center will include a new Hall, flexible meeting spaces, a kitchen, storage, and new offices. 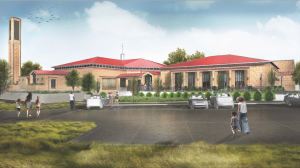 Completion of the Ministry Center will alleviate the space issues with our Parish and School for years to come. May 2018: Program Model Survey with ministries and volunteers.